Our plan for this morning was to visit Aussie World, home to a wooden wild mouse coaster. Unfortunately we arrived there to discover it had been closed for annual maintenance. Rather than pay money to enter a park we would want to return to anyway, we elected to visit somewhere else instead. Park staff did not know when this maintenance would be completed but suggested we should phone ahead, something that we'll definitely be doing for future trips to out of the way places. 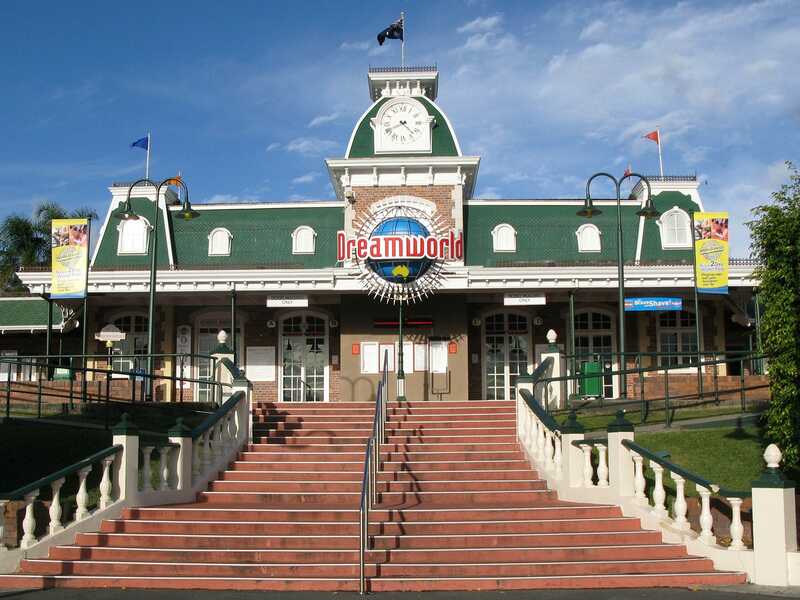 The two hundred kilometer detour meant that we arrived at Dreamworld a little before noon, only to be greeted by a torrential downpour. The weather was spectacular for all the wrong reasons; projectile rain that managed to drench me in seconds even with a waterproof on. Interestingly enough nobody else in the park was wearing weather gear, showing that they knew something I didn't. In true form, the sky gradually cleared leaving us with a pleasant albeit overcast day. Our intitial impression was of a particularly nice park, sporting a good mixture of extreme thrill rides and family attractions. However, we quickly learned that staff enforce some particularly neurotic rules that are pointless in the extreme. 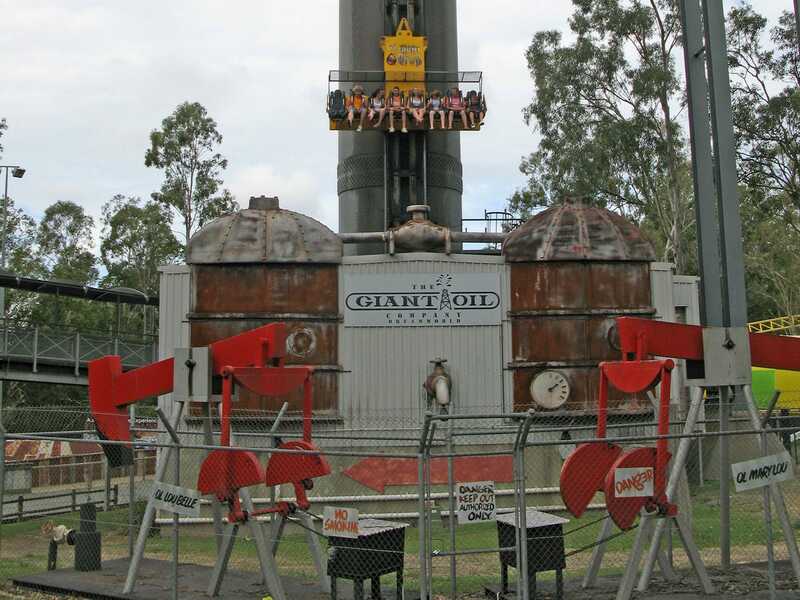 Several rides had rules which stated that all pockets should be emptied, including those closed with a zip. This frankly is nonsense; nothing is going to come out of a zipped pocket, particularly not one the rider in question is sitting on. Patrons were expected to either hire a locker (at additional cost) or leave their items in an insecure area, the latter being less than ideal for a wallet with credit cards in it. Additionally, there was a flat out ban on glasses aboard coasters, even those secured with a strap. Cyclone (#1117) was the only coaster operating as we entered the park. As with all Arrow designs of this vintage the ride was at its best in the inversions and on perfectly straight track. The rolling stock simply isn't capable of doing much else without bouncing up and down on the rails, and the lack of room especially in the rear of each car meant that every bump hit home. On the plus side, the exit queue featured some very unique looking theming, albeit not unique enough to make me want to ride more than once! The best coaster of the day turned out to be the Tower of Terror, one of two identical rides built by Intamin in the late 1990s. The premise is simple; a fifteen seater car is accelerated down a track and up a tower, and then gravity takes over for the return journey. Though on paper these designs reach one hundred miles per hour the reality is a bit different; the cars make it no more than two thirds of the way up the tower on a good day. Be that as it may the ride was still a serious rush, though I couldn't help but wonder what it might have been like at full power. On a semi related note, I've made two attempts so far to ride its brother in the United States without luck, though I'll be there again next week for another shot! The new attraction for this year is the first Intamin Motorbike coaster, which the park has branded after a local hero as Mick Doohan's Motocoaster (#1119). The ride was operating one train today even though a second was clearly visible on the transfer track, resulting in a totally unnecessary two hour wait. At any rate, Intamin's attempt at putting bikes on a coaster track is somewhat less refined than the Vekoma original. The riding position is not as comfortable, particularly on the knees, and the whole ride loses speed far too quickly. The end result is a family coaster, and while that may be what the park wanted it is not worth waiting for for the average thrill seeker. Having said that, it is right next to a ride that most certainly is. The Giant Drop shares its structure with the Tower of Terror, and its cars rise to the very top of the one hundred and twenty metre tall tower. This makes it almost fifty feet taller than the Blue Fall, itself a rather impressive structure. At any rate, two cars were dropping into the brakes as I approached, and from one came the most heartfelt scream of holy s*** I've ever heard, in this case from a young female Australian. She was probably heard all over Queensland. The seats on this particular tower are not the usual moulded plastic seen on all the other Intamin drop rides; instead, they are soft padded leather. They were surprisingly comfortable, and showed no signs of wear and tear that I could see. The majority of the ascent is fairly rapid, but the car slows to a crawl a few metres from the top, taking the better part of a minute to make it the rest of the way. This is totally imperceptible from on board, making nervous passengers wonder for a very long time when the final drop will occur. While we waited for our doom there was a loud roar from ground level, and the car started shuddering noticeably. It turned out to be the car from Tower of Terror on its way up and down the tower; the energy obviously had to go somewhere. The drop itself was simply awesome; there's no other word for it. Some enthusiasts have commented in the past that shorter drops can be as thrilling as the larger ones, with the initial moment of freefall being the same no matter the height. This is arguably true, but nevertheless nothing can beat the feeling of several long seconds of pure delicious freefall. Energy levels were running low at this stage, so we decided to go for something a bit more sedate. The Thunder River Rapids managed to thoroughly drench me after I let myself be talked into riding without my waterproof; never again. Following this, the Big Red Car attraction made me very glad that I'm not subjected to Australian television at home (see here for more). We spent our last half hour exploring the wildlife exhibit at the back of the park.